I think the great thing about L.A. is there are so many “casual” businesses. How often do you really see people in suits walking around?… Not so often. In other large cities, it’s business suit galore and that’s fine! Nothing wrong with it but sometimes it is so nice not to separate your work clothes from your casual clothes. It just gives a sense of comfort on so many levels. It’s more comfortable to talk to people who are dressed casually. I know I feel more comfortable working and running around on busy days and I’m sure others agree! Is this why so many people are moving to California from all over the country? 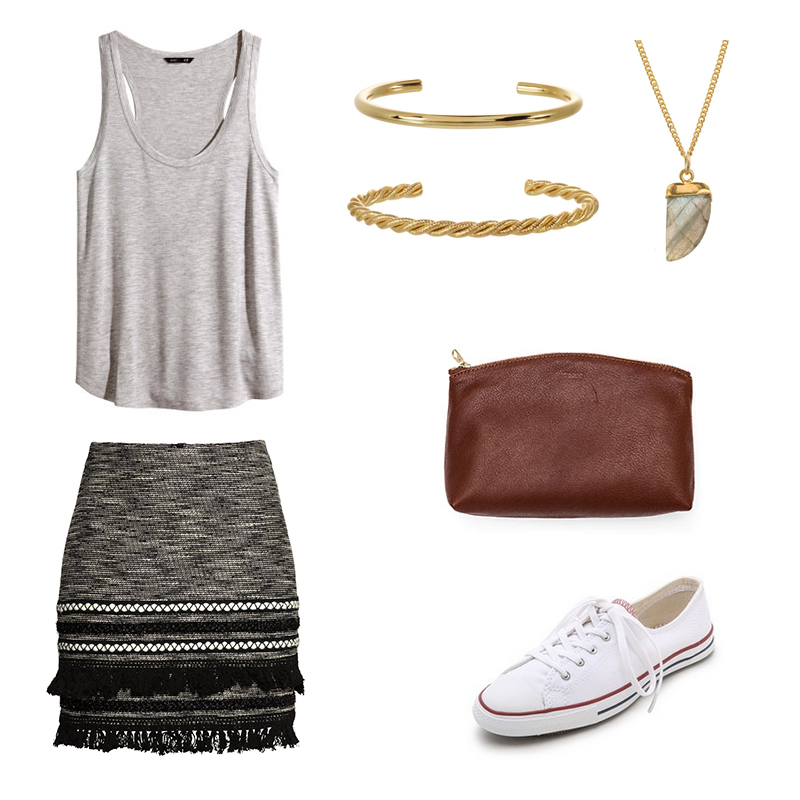 For the outfit shown, you can definitely opt out of wearing sneakers with this skirt. If you prefer a sandal or even a clean black mid-heel, that works too! That’s the great thing about knit/tasseled skirts – they go with any basic. If you feel uncomfortable wearing tanks at work, you can even replace the above with a short sleeved, crew neck t-shirt. This is an especially great outfit if you know you are going out for drinks after work! Just pop on a tinted lip color, throw on some heels and wam-bam you’re ready to go. ← The RMC Closet: Spring Is Upon Us!